We offer quality work complimented with experience you can trust. Cabinetry, Closets, Bars and More! At Bits Custom Cabinets our goal is to make your dream kitchen, bathroom, remodel, bar or closet a reality. We are happy to sit down and help you determine which cabinets will best suit your needs. From picking out the wood species and finishes, to selecting the countertop to complete the project we have you covered. We can build your new beautiful custom wood cabinets that suit you. Store & Entertain in Style! Whether it is a master closet or that “dead space” where nothing else seems to fit, we can help you organize your space. Double hanging, shoe racks, drawers, long hanging, cubbies and shelves we can make your space fit your needs. Creating a bar is more than just a place to have drinks at, it is a place to socialize and build longlasting friendships. When you entertain at one of the bars built by Bits Custom Cabinets, you show a commitment to providing an amazing atmosphere to gather. 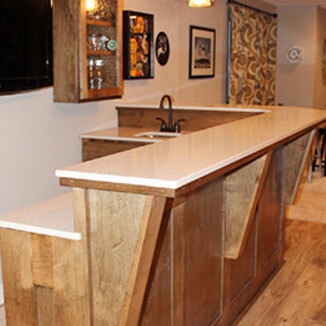 Call us today to get your bar project done and in use. Bits Custom Cabinets builds high-quality cabinetry that has been customized for you and your desires. We commit ourselves to every project we begin and work hard to make the cabinets you dream of for your home. We specialize in kitchen and bath cabinets, custom built bars and closets for homes in the Fargo, West Fargo and Moorhead areas! If you are building a new home or remodeling your current home, give us a call or contact us today so that you will have amazing cabinets, bars and closets in your house. Take advantage of experience you can trust! "Brett, from Bits Custom Cabinetry, did an amazing job on our cabinetry. He was personable and easy to work with, efficient, and left the job site clean. Using our suggestions and his craft and experience, our kitchen, mudroom, living room, and bathroom turned out better than we could have imagined!!" "Bits Custom Cabinets absolutely provided the best quality workmanship and value anyone could expect. Brett did a great job explaining the project, defined in writing what we could expect, and followed through on his time lines. In short, we would be happy to recommend Bits Custom Cabinets to our friends and family. They did a superb job!" "Bits Custom Cabinets did an excellent job on our cabinets for our new home. I wanted a unique glaze on our cabinets that I had seen years ago but didn't have a picture of. Brett did a great job taking my ideas and finding the color and finish that I had in mind. I have my dream cabinets and would recommend Bits Custom Cabinets to anyone looking to build or remodel their home! "